the U.P scenery - it looks like a painting! We’ve returned from the Summer 2015 Elks Scholar Service Trip with many memories of the beautiful Upper Peninsula, new constructions skills, and bonds that will last long beyond the trip. For an inside look into the trip, check out this short film! As the Elks Scholar Fellow, it is my responsibility to ensure that Elks scholars learn about the societal issues that we will be serving on the trip so that they can understand the impact that their work has within society. I am passionate about equipping scholars with the ability to apply what they are doing on the trip to their lives back at home or on campus. I was prepared to help the scholars learn on the trip, but I wound up learning so much from them in the process. I know that our Elks scholars are accomplished, diverse, and inspiring students attending colleges and universities all across the country, but I got to experience what can happen when we get a group of them together for a whole week to do service. I learned that our scholars could accomplish more than our Habitat for Humanity Site Supervisor ever believed possible because of their dedication to serving wholeheartedly and employing some good, old-fashioned teamwork to get their tasks done. I saw them learn that even though they were each from different universities, grew up in different states, and had different personalities, they were able to forge relationships and realize that they had more in common than they originally thought. I also learned that Bratwursts are delicious when I tried my first one at our dinner at the Manistique Elks Lodge. 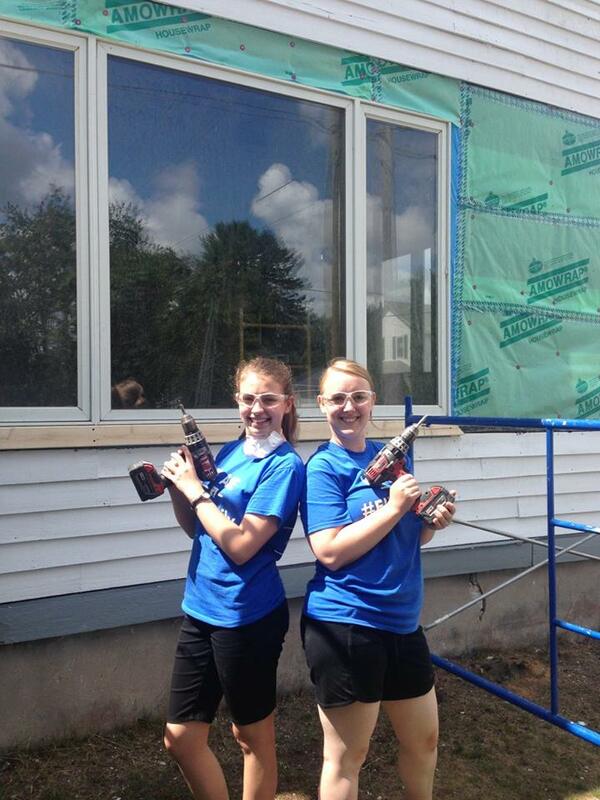 Anne and I show off our #Ladypower on the work site. For many of us on the trip, myself included, it was our first experience serving on a Habitat for Humanity site. When we arrived to the worksite, I looked at the house and all of the repairs that needed to happen and thought “How can I make a difference? The only construction knowledge that I have is how to use a power drill.” However, once we each took up a task and were able to become skilled at that one particular job, we started to see big improvements happen in the house as a result of each of our small efforts. I was reminded how easy it can be to look at a problem and become overwhelmed with how to “fix” it, or to become bogged down by how to “help” the most people that you can. But if you’re able to focus on serving the person or cause in front of you in this particular moment, you can have a huge impact in your own unique way. And when you’re seemingly small effort is combined with others’ small efforts, big changes start to happen. After emailing with the scholars who would attend the trip and members of the Manistique and Escanaba Lodges about coordinating our visit for the past few months, it was so great to finally connect with everyone in person. It was a wonderful experience for me to see the scholars connect with each other, ENF staff and Elks members. It’s easy for us to welcome scholars into the Elks family and to tell them about it, but it’s a really special sight to see the Elks scholar network and the scholars’ Elks family become a tangible group of people who are here to support them for the rest of their lives. Now that's what I call #ElksFamily. I learned that when we get Elks scholars together, truly amazing things can happen. I’m so excited to see the impact that Elks scholars are able to make through the subsequent service trips. I can’t believe that this is only the beginning–that is the most exciting part, for me. With the Winter and Spring 2016 trips coming up, I can’t wait to learn from, serve alongside, and connect with more of my Elks family as we make an impact in the name of the Elks.